The Pratt Museum and Homer Council on the Arts (HCOA) are pleased to announce that our two organizations are in conversation about the possibilities of collaborating to make use of the existing museum building as a performance, art and activity space. 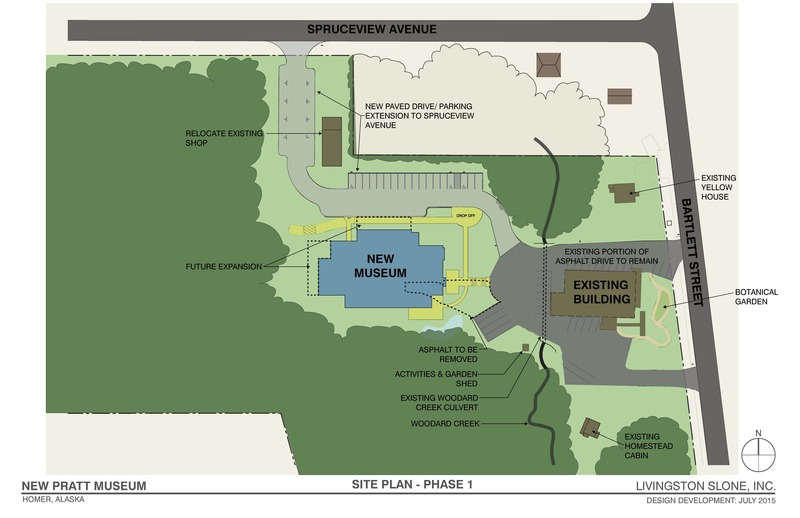 The future Arts and Culture Complex, to be located on the Pratt Museum’s 9.8-acre property, is envisioned to include the new Pratt Museum building, the newly-defined performing arts and community building, and the existing historic cabin and shop. This newly-defined space would also serve the region by providing a location for meetings, events, and workshops. Last fall, the Pratt Museum reexamined the idea of re-purposing its existing building, based on the positive collaborative work that has been occurring throughout the community within the last two years. In response to ongoing dialogue, results of the Parks Art and Recreation (PARC) survey released earlier this year, and the number of nonprofit organizations on the Lower Kenai Peninsula, the two organizations saw this as a unique opportunity to meet community needs. Both are excited to move forward with planning and collaborative work to implement this vision. The Phase 1 Site Plan is shown here. Phase 2 is a future project to open up the part of Woodard Creek that currently flows underneath the Museum’s parking lot behind the existing building. The Pratt and HCOA will be working diligently over the next several months to further develop this vision of an arts and culture complex. We invite the community’s ideas ̶as well as a commitment to join us ̶ in creating this important and vital center for our community.